eBroadcast recently scored a record number of users to its TV Guide and Movie Guide portals, proving more than ever that Australians are embracing online techniques to look up and book traditional forms of entertainment. Over 500,000 unique users per month have been visiting eBroadcast.com.au to check what's on TV and at the cinema. Over 20% of those users were first time visitors. We're impressed at those figures, but not surprised. For over 10 years eBroadcast has witnessed a marked increase in different demographics embracing the online world as a tool for making entertainment choices. 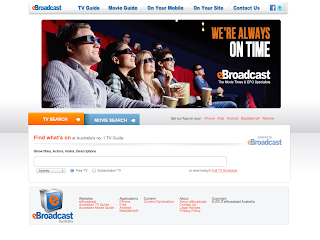 Whether it be for looking up what's on TV tonight or directly booking a seat at their local cinema, eBroadcast helps people discover Australian TV shows & movies. Our technologies help them enjoy that content virtually anywhere, on any device. It is great to know that over half a million people are watching us in 2013. We hope to continue to deliver to our users more great products in the weeks ahead. We're only warming up.